Over an illustrious career, Joe Schlesinger played several roles at CBC both behind the scenes and in front of the camera. But perhaps his most remarkable story was his own. 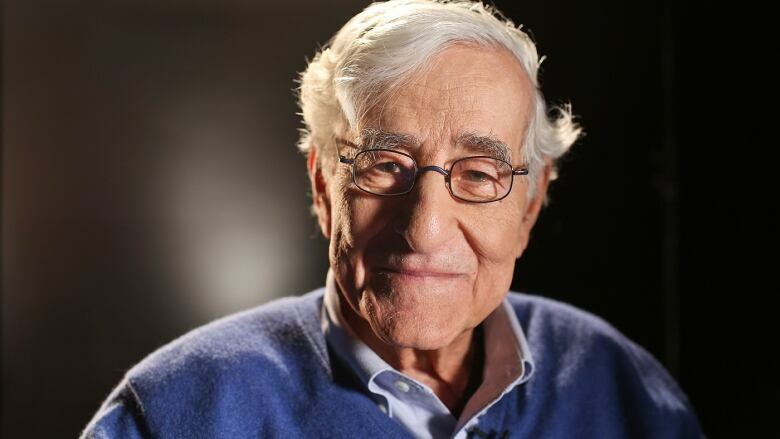 On Monday, we marked the passing of our beloved colleague and friend Joe Schlesinger, at the age of 90. Over an illustrious career, Joe played several roles at CBC both behind the scenes and in front of the camera. As a foreign correspondent, he visited numerous war zones, where he was always able to bring out the human element. But perhaps Joe Schlesinger's most remarkable story was his own. Born in Vienna and raised in Czechoslovakia, Joe and his younger brother were sent by their parents on the Kindertransport to England after Hitler occupied Czechoslovakia in 1939. Following the war, Joe embarked on a career in journalism, working for the Associated Press in Prague. In 1950, as the communists moved into Czechoslovakia and began arresting journalists, he fled to Canada. He attended University of British Columbia in his adopted country, working for papers in Vancouver and Toronto before returning to Europe to eventually become managing editor of the International Herald Tribune – and to Paris, where he met his future wife, Myra. He returned to Canada in 1966 and joined the CBC, where he became executive producer of The National. But his true passion took him abroad, where over the years he worked as a foreign correspondent from Hong Kong, Paris, Washington and Berlin, brilliantly reporting on the Vietnam War, guerrilla wars in Nicaragua and El Salvador and many other conflicts. And then, remarkably, in 1989, 50 years after fleeing his homeland, Joe returned to Prague to witness and report on the Velvet Revolution. Joe was appointed chief political correspondent for The National in 1991, and although he "retired" three years later, that did not slow him down, as he continued as a special contributor to news programs. In 1994, CBC News aired "Through My Eyes," a two-part special that documented his incredible life and career. Joe stayed in the public eye on CBC Newsworld as he went on to host and share his singular insight on Foreign Assignment. Joe once commented, "I have a career of wandering around the world, watching the universe and actually getting paid for it. It's like a little boy's dream." Joe's accomplishments were acknowledged with numerous awards, including the Order of Canada, the Canadian Journalism Foundation's Lifetime Achievement Award and several honorary doctorates. We are so fortunate that we were able to thank Joe for all that he has done for us, when in 2016 we inducted him into the CBC News Hall of Fame. That ceremony was hosted by Peter Mansbridge, former anchor of The National and chief correspondent for CBC News, who today remembered Joe Schlesinger. "In the last couple of months, Canada has lost two of our best-known foreign correspondents, Michael Maclear and Joe Schlesinger," Mansbridge said. "Their passing is a tremendous loss but at the same time they have been remarkable treasures to Canada as outstanding journalists and mentors. The secret to great reporting is great storytelling. And there are very few journalists who can compete with Joe Schlesinger as great storytellers. An extraordinary person on every level. And we're all the richer for it." Joe had a formidable intellect and a natural curiosity that always led to interesting insights in the stories he told. He was remarkable – a giant in our profession. Our condolences go to Joe's wife, Dr. Judith Levene, to daughters Léah and Ann, and to his many friends, colleagues and admirers.